Who’s Ready for the Genealogy Do-Over? Are you in a muddle with your research? Do you really know what records you have got? Do you think you could and should have cited your sources better? And what about organisation, do you know where to find anything? If you find yourself agreeing with any of these question, maybe it is time for a “Genealogy Do-Over”. Firstly for those who haven’t heard of the term “Genealogy Do-Over”, let me explain. It’s a term that was coined by Thomas MacEntee of Geneabloggers when he decided to put aside his 20+ years of research and start all over again. The Genealogy Do-Over started in January 2015 as a weekly program and lasted 13-weeks. Then in January 2016 the format switched to monthly, and due to popular demand it’s back again for 2017. Once you get over the horror of the idea of having to start all over again, it makes sense. What you know now about researching is no doubt vastly different from when you first began, therefore you will record thing better. You understand more about records and are likely to glean from them. And I’m sure most of you are more methodical now when searching. And from the 1000s who’ve already taken part, you’ll hear many success stories of breaking down brickwalls by rediscovering records they already had which answered questions they hadn’t picked first time around. The next round of the Genealogy Do-Over starts Monday, 2 January 2017, and Month 1 topics are: Setting Previous Research Aside and Preparing to Research. If you’d like to be notified each month about the new topic as well as other updates involving the Genealogy Do-Over? Click here to sign up. In addition, if you are on Facebook, click here to join the Genealogy Do-Over Facebook group and join with over 12,000 other participants in various do-over discussions. 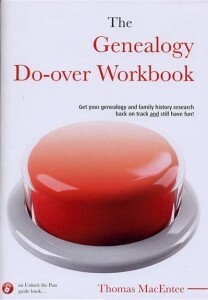 To accompany you on your Do-Over ,Thomas MacEntee has created the Genealogy Do-Over book. This is available in both book and ebook format. So if you want to get on your research back on track, take part in the Do-Over, and I promise you, you will find encouragement, enthusiasm and guidance along the way. And just think how much better your research will be afterwards! PreviousHow Do I Start My Family Tree? Canada 1921 Census is Now Online!